I was hanging around Sandvika (Yes, I know) the other day, when I stumbled upon this beautiful brigde, spanning and being reflected by the Sandvika river. I googled around a bit after taking the picture, and it turns out this is Norway's oldest cast-iron bridge, designed and built by Count Herman Wedel Jarlsberg in 1829. It spans 22,5 meters, is 5 meters wide and is only used for pedestrian traffic. Already partly hidden by greenery, the bridge now looks pastoral and cute, but I imagine that it must have looked very fresh and modern in its time. I like the circle-shaped holes in the sides, which, I suppose, are there to take some weight off it. While cast-iron is a great material, often providing a handmade look and a finely textured surface, it's also very heavy. I also found out that I'm not the only one who's been inspired by this subject. 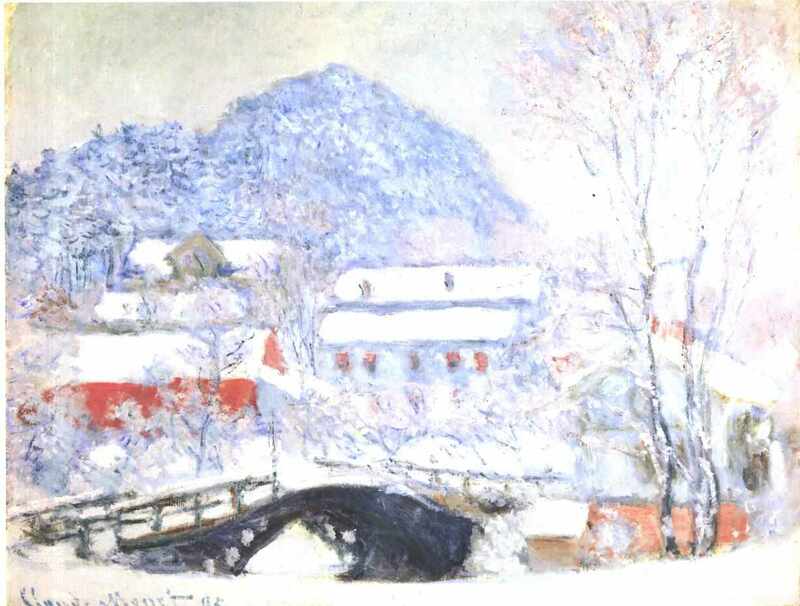 In the winter of 1895, one of my favourite painters, Claude Monet, spent some time in Sandvika, and among his paintings from the time you'll find this one, depicting Løkke bridge in it's original location further down the river. You can find versions of it both in the Norwegian National Gallery and at the Art Institute of Chicago. A beautiful bridge of a lost time! I'm sure Monet wouldn't have stopped long time in Sandvika if he had passed by these days. Anden info: 1. udgave. 264 sider.